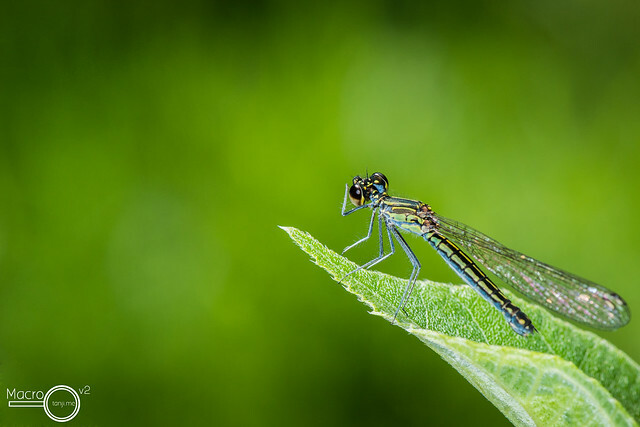 Damselflies are insects that look like smaller versions of Dragonflies, also with two bulging eyes, two pairs of wings and a very long abdomen (or tail). 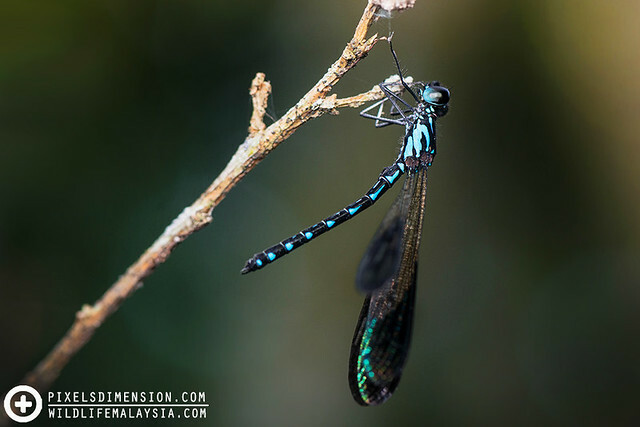 Damselflies can be distinguished from Dragonflies by their smaller and slimmer bodies, eyes that are located at each end of the head (not touching one another), and by that fact that most damselflies have their wings closed while resting. 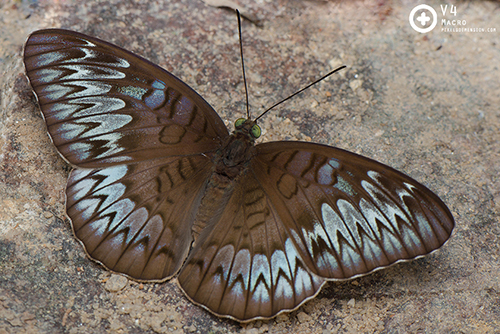 Eager to know more about these graceful fliers? Please read on! #1. A beautiful, blue-coloured male Prodasineura damselfly (Prodasineura laidlawii). 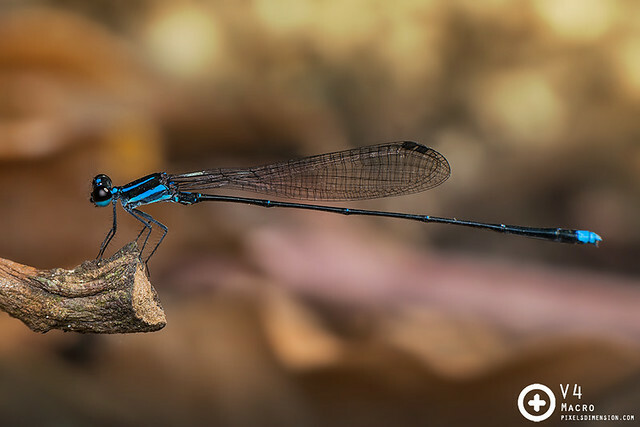 Like dragonflies, damselflies are territorial and will perch on twigs or leaves to guard their territories. Note the slimmer body of damselflies, and how their wings are closed when resting- different from dragonflies. #2. A young, male Variable Wisp (Agriocnemis femina). 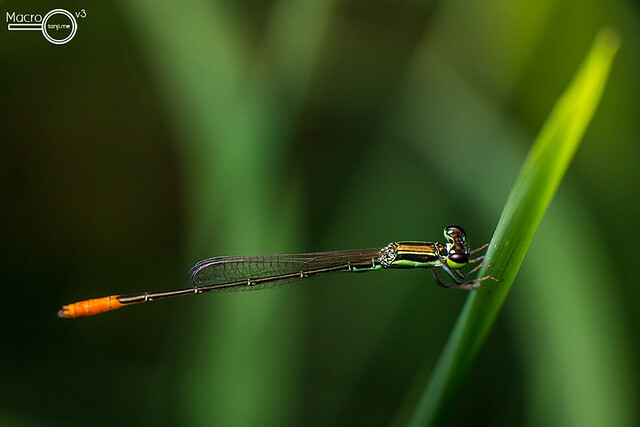 Some species of damselflies such as this one show huge variations in terms of colour and forms, so it can be easy to mistake them to be different species when they are not. #3. A female Goldem Gem (Libellago cf. lineata) cleaning its eyes. 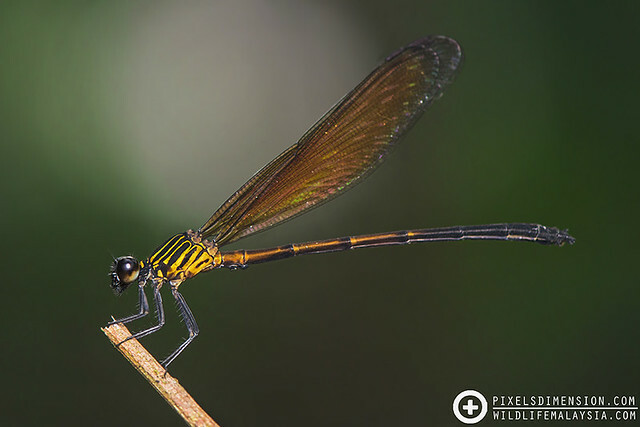 Unlike other damselflies, this one is grouped under the family Chlorocyphidae (often called Jewels) as they have stout abdomens that are shorter than their wings. #4. A male Common Flashwing (Vestalis amethystina). 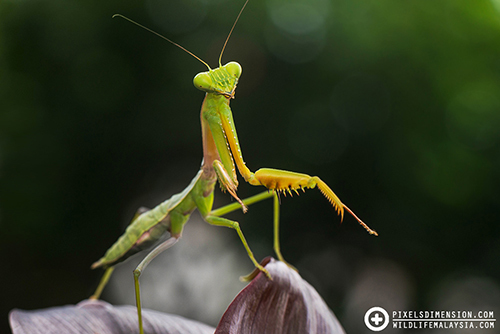 Damselflies are generally small, but there are some that are as large as dragonflies. 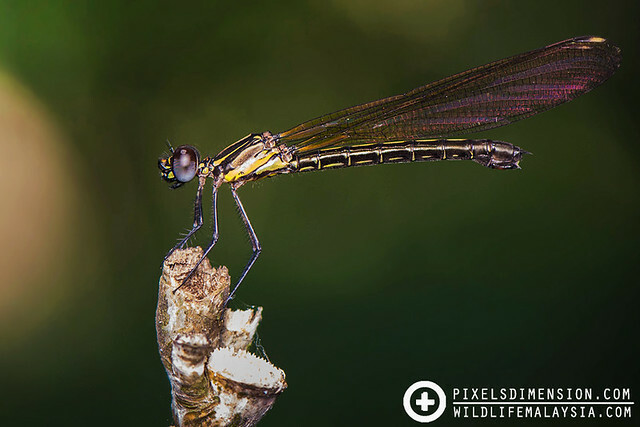 Often found around quiet and shaded streams, this particular type of damselflies is easily recognizable by the metallic green body and sparkling purple wings! #5. A beautiful perching Jewel (Heliocypha sp.). Some damselflies can occur in a great range of colours, making them a spectacle sight! The vibrant colours are probably one of the traits for selection by the females. #6. A mating pair of “Deceptive” Coraltails (Ceriagrion fallax pendleburyi). An uncommon damselfly, usually found around swampy areas at higher elevations. 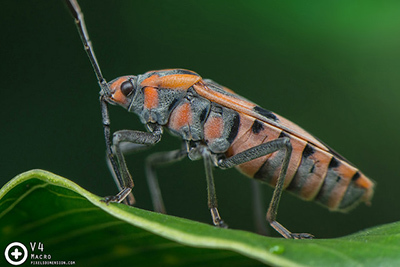 Note the heart-shaped mating wheel. 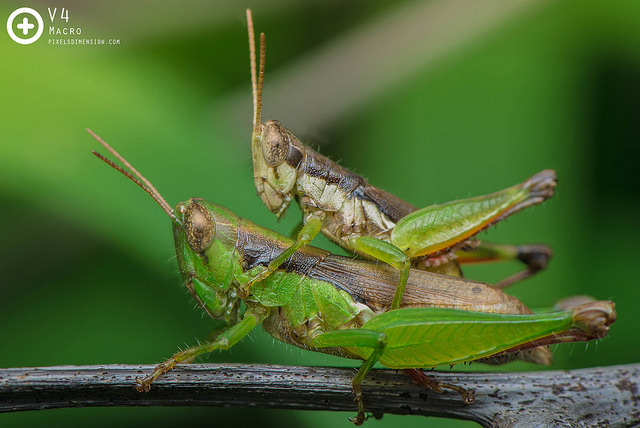 The female (bottom) is seen receiving sperm from the secondary genitalia of the male (top). 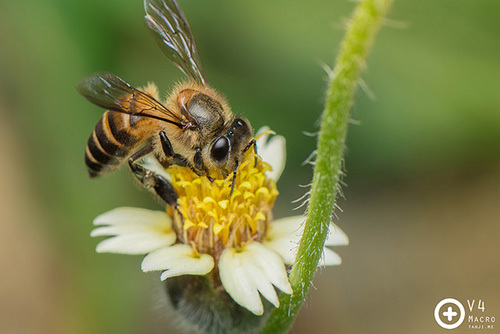 Fertilization of eggs only takes place when the eggs are being laid. #7. An unidentified, female damselfly. 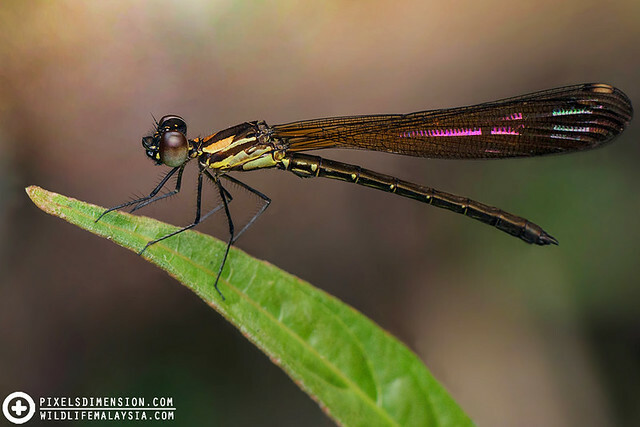 This particular damselfly has a tail that is shorter than its wings, so it under the family Chlorocyphidae; or more commonly known as “Gems”. 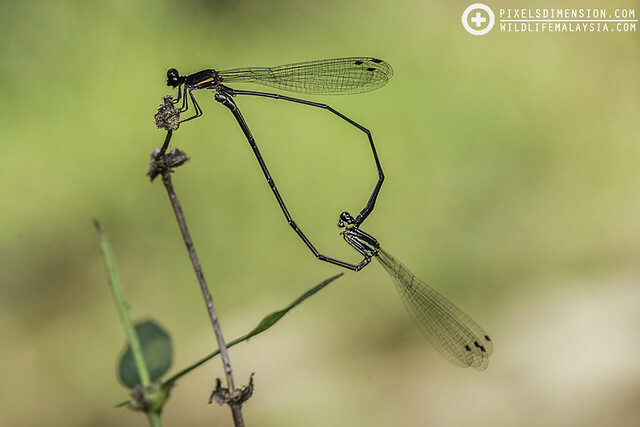 These beautiful damselflies can usually be found in botanical gardens to forest parks, where they love to just perch on small twigs. #8. A male damselfly (Rhinocypha perforata) in distress. This beautiful, Common Blue Jewel (previously known as Heliocypha perforata) was seen struggling to free his legs from some spider silk, and even resorting to chewing off the fine and sticky threads. 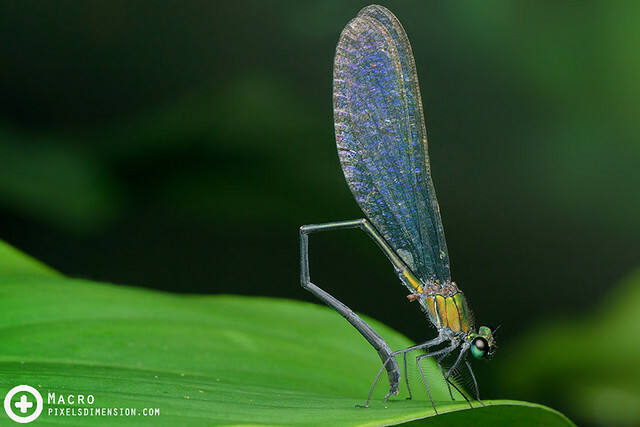 These damselflies prefer quiet, protected backwaters. #9. A male Ocher Satinwing (Euphaea ochracea). This beautiful male damselfly is grouped under the Satinwing family Euphaeidae, displaying a stout and relatively short body. This particular species of damselflies are not uncommon, but are generally localized, preferring less disturbed areas near streams. #10. An Orange-striped Threadtail mating wheel (Prodasineura humeralis). 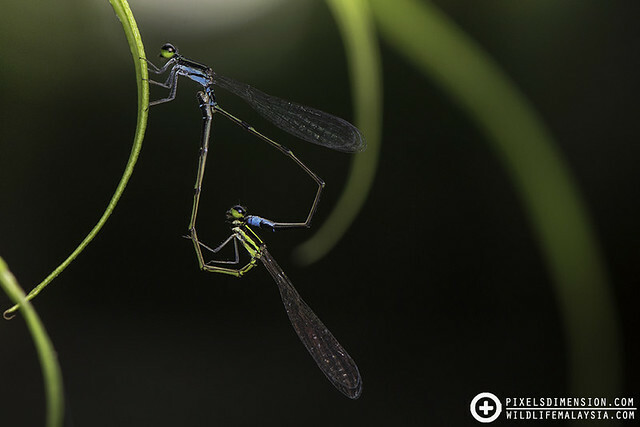 A lovely damselfly couple forming the mating wheel. The female (bottom) is seen receiving sperm from the secondary genitalia of the male (top). Fertilization of eggs only takes place when the eggs are being laid. #11. A Variable Sprite (Agrocnemis rubescens ♂♀) mating wheel. 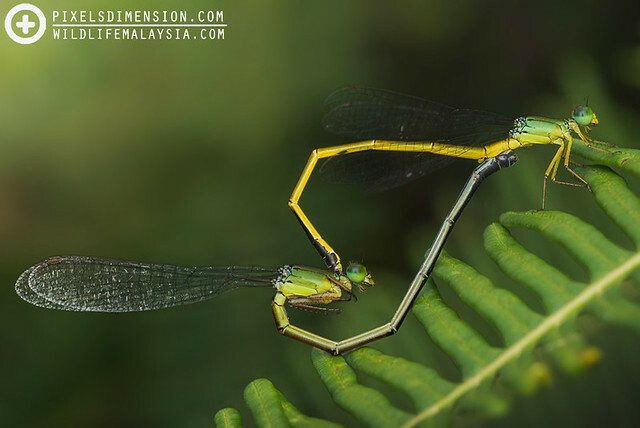 Mating odonates are usually very sensitive to movements around them as they are slow and fragile during copulation.